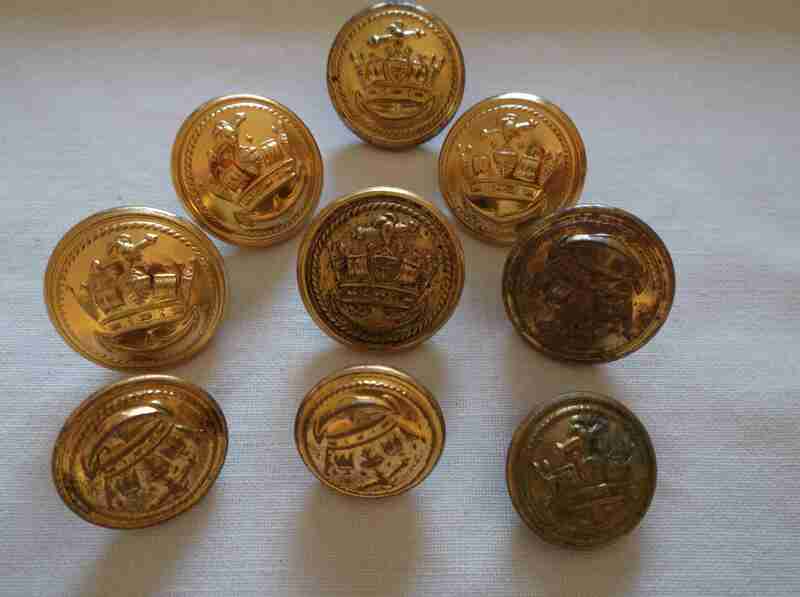 DESCRIPTION -- From a most famous of cruise ships the Royal Yacht Britannia this is an officer's uniform badge and dates from the 1950's. 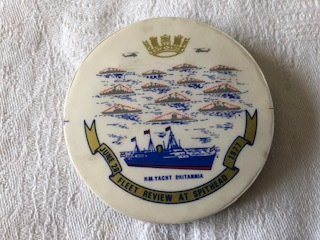 HISTORY -- The Royal Yacht Britannia was home to Her Majesty The Queen and the Royal Family for over 40 years, sailing over 1,000,000 miles around the world. Now berthed in Edinburgh, you can follow in the footsteps of Royalty to discover the heart and soul of this most special of Royal residences. DESCRIPTION -- Original souvenir lapel pin from the vessel the Swan from the Windermere Steamers Company, which is in an excellent condition and dates from the 1940â€™s/1950â€™s. HISTORY -- Windermere is famous for its 'Great White Birds' - the steamers of the company are named TERN, TEAL, SWAN and SWIFT. The term 'steamer' is a slight misnomer however because all the ships are now diesel powered although there is a move afoot to reconvert one of them back to steam power by the new managers - The Windermere Iron Steamboat Company. The TERN and SWIFT were built for steam power in 1891 and 1900 respectively. The TEAL and SWAN in 1936 and 1938. HISTORY -- The Merchant Navy has been in existence for a significant period in British history, owing much of its growth to British imperial expansion. As an entity in itself it can be dated back to the 17th century, where an attempt was made to register all seamen as a source of manpower for the Royal Navy during times of conflict. However that registration of merchant seamen failed, and it was not successfully implemented until 1835. DESCRIPTION -- Lapel pin badge from the Swedish Lloyd Line shipping company which shows on it the company houseflag and is in an excellent condition. HISTORY -- The origins of Swedish Lloyd date back to 1869, but it was only with the purchase of Thule Line in 1916 that they entered the North Sea passenger market. The Thule Steamship Co. had been formed in Gothenburg in 1870. They traded between Gothenburg and Granton (near Edinburgh) in Scotland, chosen because the Wilson Line (Thomas Wilson & Son) was already dominant in Hull, and London was already served by the London Line of a different Wilson, J.W.Wilson (an Englishman based in Gothenburg). Thule's first passenger steamer was the Bele of 1879. DESCRIPTION -- Original Officers badge from the British Petroleum Company London England which is in a great condition. HISTORY -- British Petroleum is the third largest publicly traded energy company in the world and the fourth largest company overall in terms of revenue. In 2010, BP had revenues of $308 billion and claimed total assets of $272 billion. BP employs over 79,000 people worldwide and is headquartered in London, England but has additional headquarters in Houston, Texas. DESCRIPTION -- Superb lapel pin from the Canadian Pacific Line vessel the Empress of England which is produced in a wonderful butterfly wing background design. HISTORY -- RMS Empress of England was an ocean liner built in 1956-1957 by Vickers-Armstrongs, Newcastle, United Kingdom for the Canadian Pacific Steamships. The ship was launched in 1956; and she undertook her maiden voyage in 1957. She was a near identical sister ship to Empress of Britain. DESCRIPTION -- Original souvenir lapel pin from the vessel the Swift from the Windermere Steamers Company, which is in an excellent condition and dates from the 1940â€™s/1950â€™s. DESCRIPTION -- Lapel pin badge from the Norwegian America Line shipping company which shows on it the company houseflag and is in an excellent condition. HISTORY -- The Norwegian America Line (Norwegian: Den Norske Amerikalinje), was a cruise ship line, originally an operator of passenger and cargo ships. Founded in 1910, the company ran a regular transatlantic service between Norway and the United States, and later included a route to East Africa as well. Primarily due to competition from air travel, transatlantic passenger voyages were discontinued in 1971.